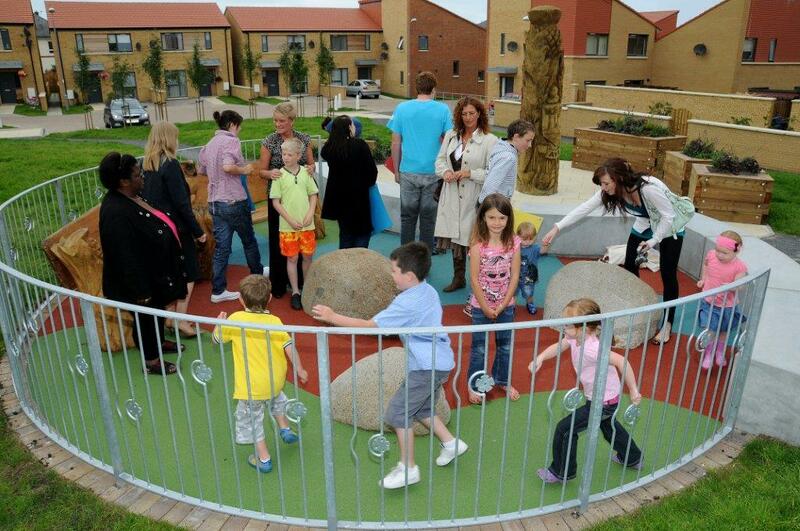 The local community has always come first in Ayrshire Housing’s redevelopment of three streets in Ayr’s Lochside. It is fitting that the final stage in the regeneration project has been the unveiling of a “Story Pole’ inspired by local young people. Alongside the building work, Ayrshire Housing and its community development partner Aspire2gether have promoted the Lochside People and Place initiative. With funding from the Scottish Government and South Ayrshire Council, this has led to a wide range of initiatives including support for a new residents group, youth and arts projects. The community group which led on the design of the new open spaces decided that a story pole would fit nicely into one of the areas. It was felt that it was important to encourage the children and young people of today to come up with the ideas for this sculpture. Everyone involved wanted a legacy of their involvement in contributing to the revitalisation of their neighbourhood..
12 young people from the Lochside Youth Initiative worked together with Learning Champion Elizabeth Robertson to come up with the specific story for the pole. They chose the Ayr as their theme and spent 8 weeks researching how they could best represent their home town. Their ideas were then sent to chainsaw sculptor Pete Bowsher who transformed the children’s ideas into an amazing work of art. The story pole shows the Ayr Burgh crest, Ayr United’s crest, the Gaiety Theatre crest, Robert Burns’ Bonnie Lassies , a swan and a thistle. As well as the Story Pole, Pete also sculpted the new seating alongside. Margaret Woods, Ayrshire Housing’s Housing Officer for Lochside said “Our tenants have commented that there is nothing in comparison to these designs and sculptures anywhere in Ayr and that it should be classed as one of the best public spaces in the town.